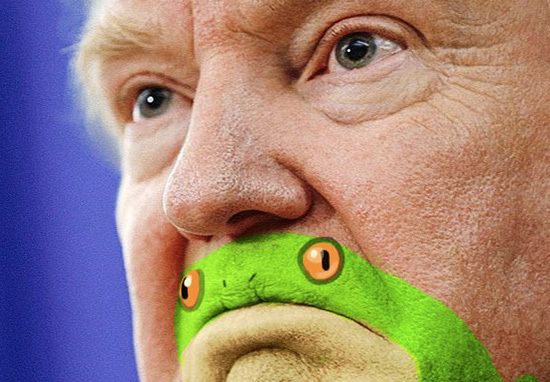 In bizarre news, someone has drawn a frog over Trump’s mouth, and it looks like it should always have been there. I think it’s fair to say President Donald Trump is divisive at times, more often than not making controversial statements, which unfortunately for him leaves the commander-in-chief wide open to having the piss royally taken out of him. Self dubbed ‘artist, idiot and voice of a generation,’ Twitter user Mike Mitchell has created a new set of work, overlaying Trump’s downward mouth, with a drawing of a frog and it’s a real thing of beauty. Love him or hate him, you’ve got to laugh at these pictures, which are a potent mixture of ridiculous and pure genius. Unsurprisingly Mike hasn’t exactly been too complimentary about America’s leader including condescending captions with ‘frog-edits’. The Twitter-joker takes a couple more swipes at the president, varying the frog drawing into appropriate expressions to suit his caption and even jested Trump had legalised weed. Not content with editing conference snaps of the yellow haired head of state, he photoshopped a copy of Time magazine to depict Trump in all his ‘frog-chinnned’ glory. Oh dear, Trump does his best to appear every bit the strong leader he believes he is and this is not going to do much for his reputation. It’s still pretty funny though. BREAKING: Trump Introduces us to His Newest Cabinet Member, a Frog Painted on His Face.